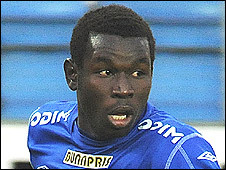 Manchester United's Senegal striker Mame Biram Diouf will be available to make his debut in January after being granted a work permit. The 22-year-old signed from Molde this year before returning to the Norwegian side on loan. Manager Sir Alex Ferguson revealed on the club's website that he has been impressed with Diouf and says he could make his debut in the New Year. "He's been training with us and is looking very exciting," said Ferguson. Diouf has scored 35 goals in 74 games for Molde, who are ex-United striker Ole Gunnar Solskjaer's former club. The forward has made one appearance for the senior Senegal national side, and is at United's disposal next month because his country did not qualify for the 2010 Africa Cup of Nations. However, he will not be available for the FA Cup tie against Leeds on 3 January.